This is a post in a series authored by our encoding team on the Intertextual Networks project. For more information, see here. I joined the Women Writers Project to create a genre taxonomy for the Intertextual Networks bibliography, a bibliography of all of the works cited in the early modern texts in the Women Writers Online collection. I wrote a bit about the process behind creating that taxonomy here. With the taxonomy in place, I was able to analyze the information contained in the bibliography: authorial genders, genre of texts, years and locations of publication, and so on. Using XQuery, I could determine things like how many theological texts were written by women, which genres of texts written in the 1700s were most often cited, and what locations most frequently published texts by women. I decided to start with a broad, exploratory approach. When I was reading through the bibliography to create the taxonomy, I noticed some general disparities between the genres authored by women and by men. I decided to follow those initial inklings and use the final taxonomy numbers to quantitatively determ­­ine which genres are most commonly cited by authors of each gender in the Intertextual Networks bibliography. The results are below. Before I go into a discussion of these results, a few things should be noted. The “count” number indicates how many texts of each genre are in the collection, including those texts without a known author. 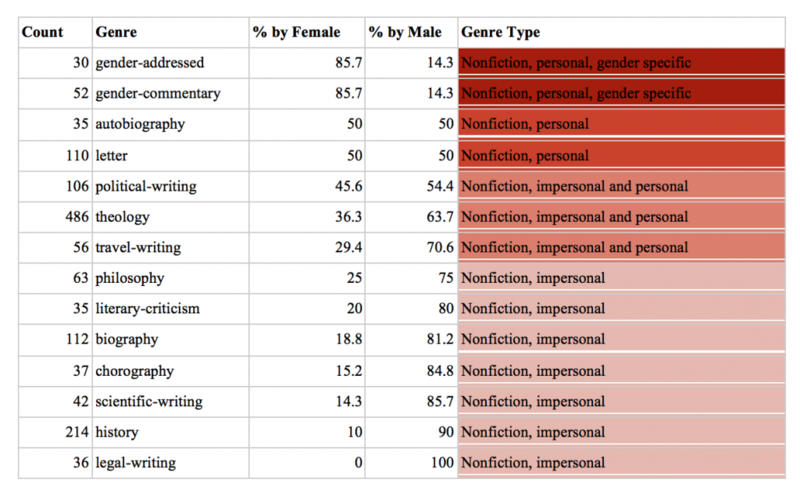 The “% Female” and “% Male” columns indicate the percentages of texts with known authorship in the corresponding genre by female and male authors. 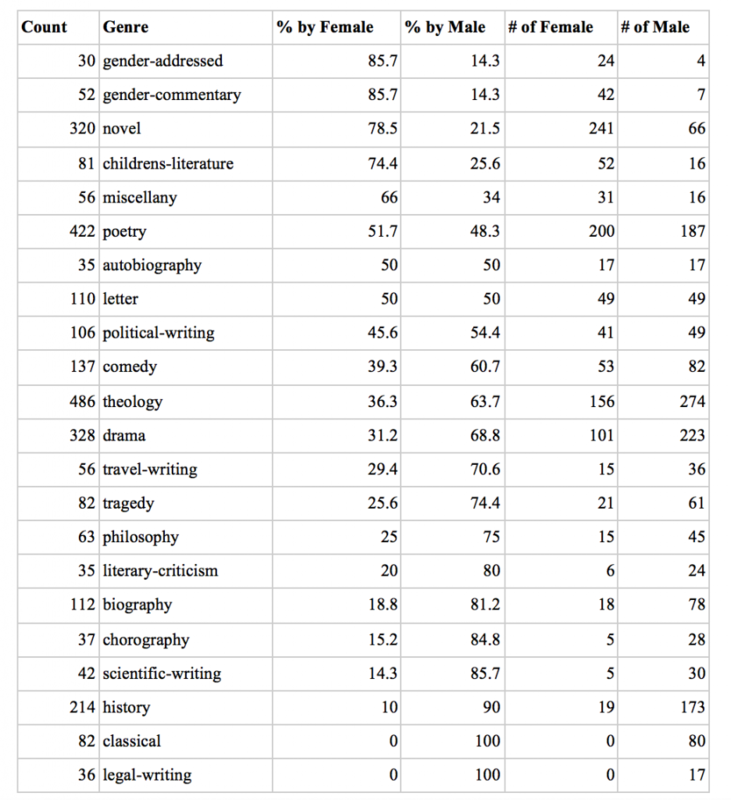 The “# Female” and “# Male” columns provide counts for texts with known female and male authors. For texts with multiple authors, only the primary or first listed author’s gender was counted so as not to skew the results. Without such an exclusion, a text with seven male authors could make it seem that a category has a relatively large number of texts written by men when in fact it does not. Texts with mixed-gender authorship were scarce, meaning that inaccurate gender counts due to this method are extremely limited. Perhaps unsurprisingly, the two genres with the largest percentages of female authorship in the collection are “gender addressed” and “gender commentary.” Texts within the gender addressed category are explicitly addressed to a gendered audience, such as Hester Chapone’s Letters on the Improvement of the Mind: Addressed to a Young Lady. Gender commentary texts address contemporary gender issues, such as Mary Wollstonecraft’s A Vindication of the Rights of Woman. In fact, 85.7% of the works from these two genres as cited in the WWO collection are authored by women. This result is far from unexpected—there are many reasons that women would have written and referenced works about gender—but it does provides some promising initial results from count-based inquiries into genre and gender in the WWO collection. The four other female-dominant categories cited by the authors in WWO are novels, children’s literature, miscellanies, and poetry. All of these can be linked with fiction and subjectivity: novels are largely fictional; poetry may be fictional or nonfictional but often highlights creativity and subjectivity; many texts collected in miscellaneous works are fictional and poetic; and children’s literature includes both fiction (such as stories) and nonfiction (such as religious instruction) works. The two evenly split categories—letter and autobiography—are both nonfiction genres that allow space for subjective descriptions of authorial experiences. 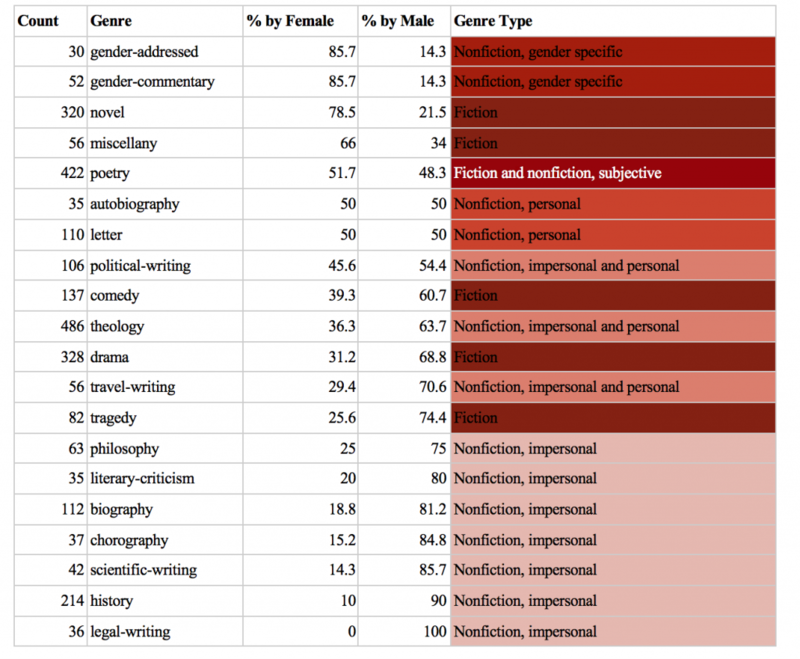 Impersonal and “objective” nonfiction genres unrelated to gender are uniformly majority male authored, and sometimes overwhelmingly so—90% of histories, 85.7% of scientific works, 80% of literary criticism, 75% of philosophies, and wholly 100% of legal texts with individually named authorship in the collection are written by men. Clearly, men had greater access to publication in—and therefore a greater voice in public discourse on—these subjects. With this in mind, the genre table can also be read as a sort of genre spectrum when sorted by gender percentage. Below I have reproduced the genre and gender table with a new addition. I removed “childrens-literature” and “classical” from this table because each contain such a wide variety of genres that they cannot be reduced to one larger genre category. The spectrum is clear. Nonfiction texts, outside of those dealing with gender issues, are far more likely to be written by men. More specifically, the more “impersonal” a nonfiction text is, the less likely it is to be written by a woman. Removing the fictional texts from the picture, a clear, uninterrupted spectrum appears, bringing this latter trend to the fore. This lack of female impersonal writing has many possible explanations, most stemming from the historical discrimination women faced during the period covered by the WWO collection. One specific reason may be that women were largely unable to participate in higher education, preventing many from gaining the specialized knowledge to write in fields like scientific writing, history, and literary criticism. Another reason may be that sexist cultural mores dissuaded publishers from publishing scholarly texts written by women. Women were blocked from participation in politics, so while they may have authored petitions based on their experiences and those of their fellows (45.6% of political writing in the collection is by women), they could not actually laws or formal legal pieces. In any case, the data from the genre taxonomy project for the Intertextual Networks bibliography indicates that women were vastly less published than men in impersonal nonfiction and nonfiction in the period covered by the WWO collection (1526-1850). While these results may not be surprising to those familiar with the period, it does serve as quantitative evidence of sexism, or at least gender-imbalanced trends, in writing, publication, and knowledge production in the time period.